BOSTON LOCAL 29 BM-ST CHARLES HANCOCK accepts the Charles W. Jones Award on behalf of his lodge. L. to r., IP Newton Jones, Hancock, MOST Administrator Roger Erickson, and MOST Chairman Greg Purdon. 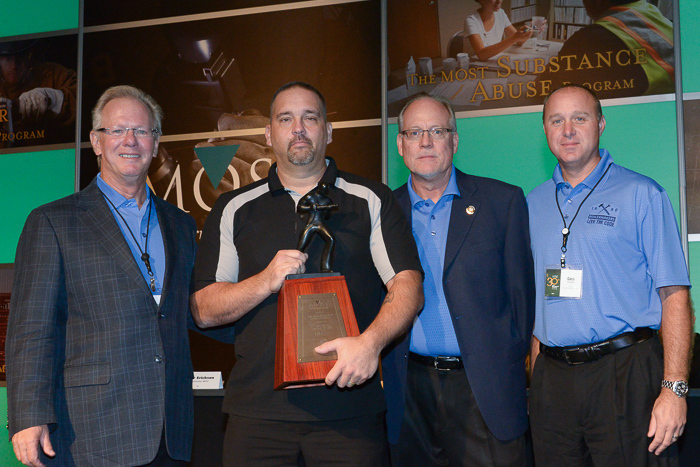 BOSTON LOCAL 29 became the fifth Boilermaker lodge to receive the Charles W. Jones Award, MOST's symbol of excellence, during the 30th Annual MOST Tripartite Conference in Myrtle Beach, S.C., October 4. Local 29 BM-ST Charles Hancock accepted the honor on behalf of the lodge. The award acknowledges the local with the highest percentage of members trained using a selection of MOST programs: OSHA 10/30, Steel Erection, Common Arc, Rigging, Substance Abuse, Leadership and Scaffolding. Previous recipients of the honor include Local 11 (Helena, Mont. ), 2014; Local 433 (Tampa, Fla.), 2013; Local 85 (Toledo, Ohio), 2012; and Local 154 (Pittsburgh), 2011.